A great choice when you want a little more telephoto reach, the powerful AF-S DX NIKKOR 18-105mm f/3.5-5.6G ED VR offers an approximate 5.8x zoom, making it possible to shoot most subjects with just one lens. Vibration Reduction (VR II) helps you achieve steadier shots during low-light, handheld and telephoto shooting, and advanced Nikon technologies ensure stunning images and videos every time. The compact, versatile AF-S DX NIKKOR 18-105mm f/3.5-5.6G ED VR is ideal for a broad range of shooting situations, from interiors and landscapes to beautiful portraits and intense action photography and videography. An ideal everyday zoom, the AF-S DX NIKKOR 18-105mm f/3.5-5.6G ED VR is optimized for use with Nikon’s DX-format D-SLRs. Nikon VR (Vibration Reduction) image stabilization provides 3.5 stops* of blur free handheld shooting, assuring dramatically sharper still images and HD video capture. 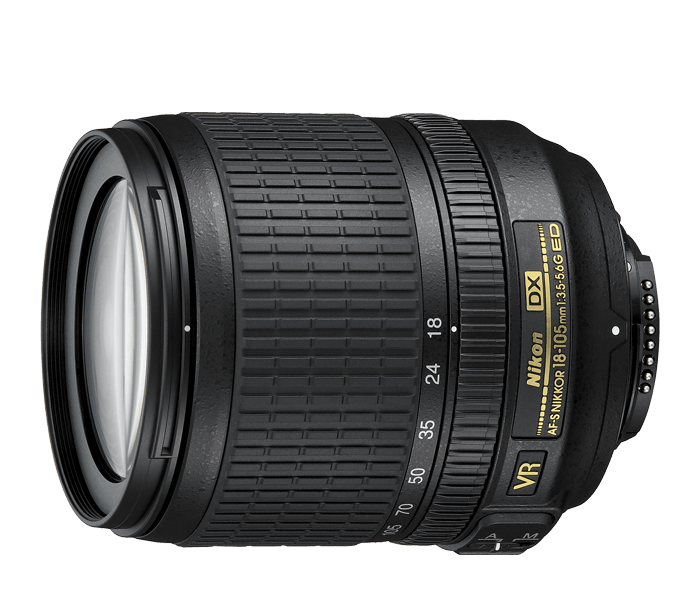 The AF-S DX NIKKOR 18-105mm f/3.5-5.6G ED VR features some of Nikon’s most advanced lens technologies to ensure the highest quality of images and videos. Nikon’s Super Integrated Coating (SIC) enhances contrast and color quality while reducing flare and ghosting. An Extra-low Dispersion (ED) glass element minimizes chromatic aberration for superior optical performance. Aspherical lens elements reduce distortion, even at the widest aperture settings. And Nikon’s exclusive Silent Wave Motor enables fast, ultra-quiet and precise focusing. *Based on CIPA Standard. This value is achieved when: DX-format lenses are attached to a DX-format digital SLR camera and zoom lenses are set at the maximum telephoto position.